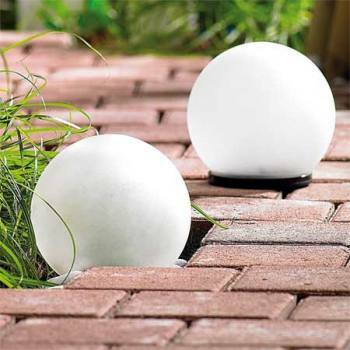 Solar-powered globe lights are extremely versatile and can create a nice ambience. They float so you can placed them on the surface of the water, or you can stake-mount them into the ground, or you can simply put them in the garden as a decorative eye-catcher. Their power comes entirely from the sun: the integrated solar panels inside the globe charge the built-in accus during the day. When it gets dark the light switches on automatically and switches itself off again at dawn. Our globe lights are available with steady-on lights in different colours or with lights with changing-colours.